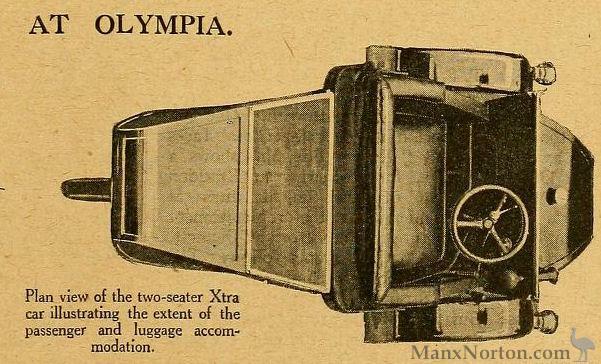 Plan view of the two-seater Xtra car illustrating the extent of the passenger and luggage accommodation. XL 1921 by Excel Co. Woking XL 1921 Frame XL 1922 550cc JAP XTRA CARS at the Olympia Show 1921 Xtra-car 1922 976cc Xtra-car 1922 Two-seater New two-seated Xtra-car, with 347 c.c. Villiers engine.